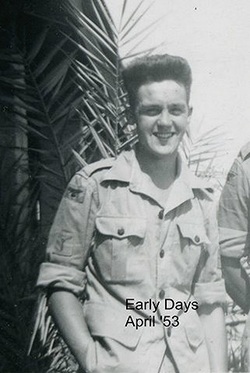 Jack Garry 4086837 Aged 18 enlisted as a 3 year National Serviceman in Manchester and travelled late November 1951 to RAF Cardington. Following the five day induction programme of kitting out, trade allocation and promising to uphold the Official Secrets Act, I was shunted off , with mainly a contingent of London erk recruits, by some demented, screaming DI`s to RAF Bridgenorth, Shropshire for the mandatory period of square bashing and mind blowing Drill Instructor therapy. How we completed the Passing Out ceremony in the freezing snow in late January, I`ll never know. Back at our billet we were summoned by one of our DI`s to be told of our new postings. Our DI, who had now morphed back into a human being, read out our postings into the real RAF world. I had never heard of Weeton so asked our now friendly corporal ( who was helping himself to our cigarettes, just as corporals do...ask Frank Petter !) where Weeton was ? His cynical reply was " somewhere in the Far East ". This shocked me somewhat but with the outburst of laughter from some of our billet mates I realised the mickey taking but it seemed to have `made his day` which was OK as we were off on seven days leave. A week later I reported to No 8 School of Tech. Training RAF Weeton, not far from Blackpool, and found myself employed in the SHQ Central Registry with two other Clerk Orgs and under the strict supervision of a civilian retired RAF Warrant Officer who was soon to educate me in the routines of RAF Station life. Each morning he sent me over to the Sergeants Mess to purchase (from the back door of course) his daily intake of Senior Service fags. Adjutant`s office. Now let me explain that in our Adjutant`s office there was a very senior, long service clerk, WRAF Sergeant McIvor from the Isle of Skye who was notorious for her disciplinary ideals in the office corridors without being pulled for something.....shoes not shiny enough, button undone or some other serious `elf and safety` matter. The outcome of my interview was thankfully not disciplinary but that I had been `selected` to work in the Adjutant`s office with Sgt McIvor and take charge of P1 and P2 Section (Officers Records, Courts Martial and Disciplinary Court of Inquiry matters etc) but first I had to take the the SAC exams to satisfy my credentials for that position. My time in that section, which also included a WRAF LAC Typist was an eye opener.My previous `cushy number` had become more so with time off during weekdays to train in football and cricket activities and making weekly trips in to Blackpool to do some shopping for `Sarge`. There would be days when I may have been busy with some Court of Inquiry proceedings or other when Sgt McIvor would say " can you leave that and go into Blackpool to collect my dry cleaning ` or whatever ! ` The Station CO and Adjutant were keen sportsmen. One day a certain AC2 Jackie Mudie of Blackpool and Scottish International fame arrived on the camp. I was told by the `Adj` that he wanted a job found for Mudie in SHQ.There was a small room next door along a corridor which housed the Station Gestetner machine for the printing of Station Standing Orders and other bumph that we had to prepare, a really dirty and messy job. Sgt McIvor, God Bless her, with a wry smile said " it seems you have another assistant ". I stuck a sign on the door..." Jackie Mudie i/c Gestetners " but the `Adj` objected to it. I did think at the time that it was a remarkable coincidence that Jackie Mudie had been posted from whereever to Weeton, seeing that he played for Blackpool. Surely the military hierarchy didn`t intentionally do such things !!! Of course the CO and `Adj` were in regular receipt of match day tickets for Bloomfield Road. In early 1953 a letter arrived from Blackpool FC for the Adjutant informing him that because the RAF authorities had kindly allowed Jackie time off for football training and attending the club matches, they would like to offer the use of the Bloomfield Road pitch and facilities to stage our Inter Section Football Final on a particular Wednesday afternoon. You can imagine the excitement and keen competition between the teams still left in the quarter-final stages of our camp section tournament. Those of us who were in teams not fortunate enough to make the final, along with what seemed like most of the RAF Weeton establishment, went to Bloomfield Road for a memorable afternoons entertainment. Another perk was distributing the many invites from local industries and business houses for certain numbers of RAF personnel to attend their dances and Xmas parties to make up the number of males v females employed by them. My mates in SHQ and my billet were never short of weekend entertainment. Those were the days, but the bubble had to burst. One day, collecting the messages from our Signals Section, I noticed my name on the postings schedule. It said something about MEAF 15. All of the `Adj` and Sgt McIvors intervention with Records Office failed to save me. I was instructed to report to SSQ for an immediate nasty jab and was given a seven day leave pass without time to say `bye to my billet and work pals and in true military fashion found myself in a vehicle heading to Kirkham Railway Station. On March 19th 1953 I reported to No 5 PDC otherwise known as Lytham just down the road from Weeton. Kitted out by an old school pal who was a storeman, more jabs then entrained at Lytham Station for the journey down to Southampton ( must have been shunted into every railway sisding en route ). Late afternoon arriving at Southampton Docks to board the Empire Windrush for Port Said via Gibraltar and Malta. The end of the line turned out to be RAF Kasfareet in the Suez Canal Zone where after a short spell living in the tent lines I was allocated a bed space in Billet 7 with a welcoming committee of bed bugs ! My job in PSCO ( Provision and Stock Control Office ) as part of 107 Maintenance Unit based in Kasfareet was to work in the Orderly Room with Clerk Organisation assignments of a serious nature for the defence of the Suez Canal. I was to supervise two LAC`s and a young WRAF typist who was always crying, obviously very home-sick, in their duties of shuffling papers around the PSCO Provisioning Sections. I had to answer to the No 2 PSCO Wing Co A.W.G. Stuart ( a good egg as they used to say ) and ensure that his large staff car was properly cleaned every morning by a couple of the village `people` which was an impossible job to handle unless i actually stood with them whilst they completed the job ( otherwise they would slip away around the corner for a pipe o `hookey` or whatever they called it. The whole situation in the Canal Zone must have taken a turn for the worse because my sudden rushed posting to MEAF 15 also included that I ensure the Wing Co`s cigarette ash tray was to be emptied, cleaned and re-filled with fine, white sand each day along with adding some artistic coloured pencil patterns to his large wall charts on stores and provision movements in PSCO. My good times were had by enjoying sporting activities, football, cricket, golf and even jolley hockey sticks ! Around February 1954 I had to report to Sqn Ldr Admin in SHQ where I was formally interviewed and told that I was now transferred to SHQ to take over the position of Clerk to the Station Adjutant. This also included the promotion of two stripes and more importantly extra ackers and that my sporting allegience was now with `Admin A` and not PSCO. To this day I will never know but have a gut feeling that Wing Co Stuart was instrumental in my career move from PSCO to SHQ. He had previously talked to me about my time at Weeton and did ask if my time with PSCO was boring compared with Weeton SHQ.